I love potatoes. I will eat potatoes anyway you cook them, except two. I don't like potato salad and I don't like potato soup. Until now. Last Sunday my mother-in-law made the yummiest potato soup ever! Come to find out she got the recipe from my sister-in-laws blog. You must try this. Even if you don't like potato soup! Green Onions, Cheddar Cheese and Crisp Cooked Bacon Bits for toppings. Mix chicken broth, water, minced onions, oregano, and parsley in a large pot and bring it to a boil. Turn heat down and simmer for 5 minutes then add melted butter. SLOWLY stir in flour . Add salt and pepper. Add half and half. Now I just need to find a potato salad recipe that I like so that I can say I have never met a potato that I didn't like! Thank you for this. 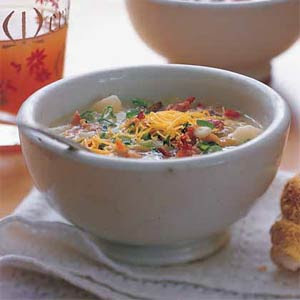 I LOVE potatoe soup but I'm afraid of soups, I've always made bad ones. I'll have to try this one! It sounds so good and fool proof. That recipe sound wonderful....I plan to try that one soon. Thanks for coming by my blog to help with my birthday wish. I appreciate it!!! YUM-A-LICIOUS!! I will be trying this soup for sure!! I will try this! I love potato soup. I bet my husband would love this! Thanks! This looks so delicious and warm! I am printing this one right now. Delish! I'm In!!!!! I love this kind of soup but have never made it. Adding it now!!!!! gasp, my 2 favorite ways to eat potatoes! Soup and salad! This sounds so yummy! Thanks for sharing. Oh, I love potato soup. I'll have to give this one a try. Any suggestions for a good tomato soup? I've been searching and have yet to find one. I think I may try this for dinner tonight. I have a great recipe, but it uses milk and cheese; your spin on it looks tasty too. If you are still looking for a good potato salad recipe, let me know! my m-i-l's is THE BEST! I will try it=) Thanks! Loved all your fall ideas, saved a few for later! You are the best=) Happy Thanksgiving!